A while back I was on vacation in South Carolina and walked into the local bookstore in search of a gift. The pro at the local tennis resort had been very kind in letting my wife and I play at his beautiful facility during the week and I thought that a good book on tennis would be a nice way of saying "thanks." I walked into the store in search of the tennis section. As always, when in a bookstore, I felt like a kid on Christmas morning. I love books and could easily enjoy an afternoon wandering the aisles of a bookstore, browsing the shelves and checking out the titles. Not today though, we had a tennis court booked in thirty minutes so I was on a quick search and buy mission. As I passed the information desk, the clerk greeted me with a very pleasant "Can I help you?" I responded with an equally pleasant "No thanks, I know where I'm going." Or so I thought. Being a college graduate, and reasonably intelligent I felt confident that I could navigate my way through the shelves, find what I was looking for and be out of there with plenty of time to warm up and stretch before my court time began. A brisk walk around the perimeter helped me to locate the sports section where I then narrowed my search for tennis. Walking the shelves, I passed archery, baseball, basketball, canoeing, fencing, golf, more golf, extra golf and finally Zen golf. Continuing on past hockey, ice skating and karate, my college education kicked in and I realized we were going alphabetically so I picked up my pace to advance to the "T" section. I zoomed past pole vaulting, running and skating, ready for the tennis section when I suddenly found myself looking at a biography of Mildred Zaharias. "Who the heck is Mildred Zaharias," I wondered. And if she didn't invent tennis, coach a world champion, or win Wimbledon, why was she in the tennis section of this bookstore? A quick glance at the book reveled that Mildred was in fact, the legendary "Babe" Didrikson Zaharias, the legendary athlete we all know. Nevertheless, to my knowledge the "Babe" had never distinguished herself in the world of tennis so what was she doing in what was supposed to be the tennis section of the book store? I retraced my steps figuring that my 47 year-old eyes were missing something. Again and again I walked forward from the "S" section and again and again I was greeted by Mildred's smiling face. Pride and college degree not withstanding, I was finally forced to own up to my apparent ignorance and return to the front of the store where I asked the clerk where I might be able to find the tennis books. "Did you try under "T" in the sports section" she asked with an expression on her face that clearly said "you idiot." Pushing aside the McEnroe in me, I controlled my temper and said that I had but still couldn't seem to find the tennis books. Apparently not believing me, she led me back to the shelves where we walked back and forth a few times with, of course, similar results. Clearly perplexed, the clerk told me stay put while she went to find the store manager. A few minutes later, the manager arrived on the scene with an expression on his face that clearly told both myself and his clerk that we were idiots. "You won't find tennis books under "T" he said, they're in the "R" section. "R" we both asked? "Yes, "R" for racket sports. Ah ha! Sure enough, right at the start of the "R's", were the tennis book... both of them. Levels of the Game by John McPhee. 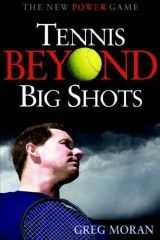 Donald Jackson of Life magazine described this book as "probably the best tennis book ever written." Using the1968 US Open semifinals between Arthur Ashe and Clark Graebner as a backdrop, McPhee's book takes us on and off the court as he's written a beautiful profile of two people, their contrasting personalities and the circumstances that have brought them together. The Greatest Tennis Matches of the Twentieth Century by Steve Flink. Flink makes you feel as if you're sitting courtside as he takes you though the ups and downs of some of the games greatest contests over the past 100 years. Portrait in Motion by Arthur Ashe. One of the games most important figures, Ashe kept a diary during his travels on the pro circuit in 1973 and 1974. Not only does the reader get a taste of what the pro tour was like back then, we also get a keen insight into the mind of one our sports greatest thinkers. The Education of a Tennis Player by Rod Laver. Written by my idol, the Rockhamton Rocket, this autobiography not only gives the reader a peek into the life of tennis's only two-time Grand Slam winner but Laver also throws in some "how to" tips at the end of each chapter. An excellent read by the man who many consider the greatest player of all time. Big Bill Tilden: The Triumphs and the Tragedy by Frank Deford. Deford, one of my favorite writers, does a phenomenal job of chronicling the aces and faults of unquestionably one of our countries greatest athletes and most tragic figures. A must for tennis players and non-players alike. Jimmy Connors Saved My Life by Joel Drucker. As both a player and personality, Jimmy Connors' importance to the game has been grossly underrated. A fascinating figure on and off the tennis court, Drucker gives us the most insightful look at Connors yet. Paralleling the highs and lows of Connors' life with those of his own, Drucker's unique book tells the story of two people's lives while at the same time allowing us to look inside of ourselves. Days of Grace by Arthur Ashe. Arthur Ashe is one of those special athletes who has truly transcended his sport and made significant contributions to society. Completed just before his death from AIDS in 1993, Ashe's memoir provides us with a look at one of the truly remarkable, courageous and inspiring figures in our countries history. Tennis Confidential by Paul Fein. Fein has put together a fabulous collection of essays, interviews and features that takes us under the covers in the world of pro tennis. A true historian of the game, Fein tackles the games burning issues and takes us behind the scenes and into the lives of those who make tennis the great game that it is. Tennis is alive and well on the courts and on the pages so after your next match, sit back, grab a cold drink and lose yourself in the pages of one of these fabulous tennis books.